The black skirt tetra (Gymnocorymbus ternetzi) is a small freshwater fish that was originally native to the countries of Brazil, Bolovia and Argentina. But in recent years, either through releases or escapes, it has become established in several other countries. It can now be found in Columbia, Thailand and there are unconfirmed reports of feral populations in the southern United States. While black skirt tetras are larger than many of the more popular tetras, they still remain relatively small in the home aquarium. Most will only grow to around 2 inches (5 cm) in length, though some of the larger females can reach sizes of up to 2.5 inches (6 cm). On average, black skirt tetras live for three years in a home aquarium. But if they are well cared for and provided with a spacious tank, it’s not unusual for them to see their fifth birthday. There are reports of them living much longer, but in my experience anything beyond five years is rare. Black skirt tetras can be housed in aquariums as small as 10 gallons, but any responsible aquarist should consider 29 gallons as the bare minimum. Larger tanks provide not only more room for swimming, but also allow for much more stable water parameters – which means healthier fish in the long run. One of the reasons that black skirt tetras require a relatively large aquarium is that they need to be kept in groups of at least five. They are a naturally schooling fish, and if they are kept in groups any smaller than this, they will become stressed and nippy towards other fish. And any fish that is stressed for any extended period of time will become more susceptible to disease, which can lead to shortened life span. They are generally considered a peaceful fish when kept in a shoal, and will do well in most community fish tanks. Any tank mates should also be docile fish, as black skirt tetras will be bullied by any aggressive fish. Just a word of warning on tank mates – there have been numerous reports that black skirt tetras and bettas will constantly fight in an aquarium, though no one seems to know why. It may be the body shape or the skirt that triggers it, but either way – they should never be kept together. Any tank containing black skirt tetras should be heavily planted, and some of the easiest plants to add are Amazon swords, Java Moss, Java Ferns, Hygrophila Polysperma and Water Wisteria. The addition of floating plants will also be appreciated, and to help to mute the light in the tank. Duckweed and Amazon frogbit are generally the easiest floating plants, but you may also want to try one of the more difficult floating plants like water lettuce or hyacinths (only if you have an open top aquarium). 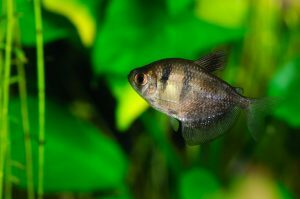 When it comes to choosing a filter for black skirt tetras, they don’t have any special filter requirements, and an HOB (hang-on-back) filter would be more than adequate. Depending on the size of the aquarium, a canister filter may also be a good choice, but it is generally overkill for a fish like this. I would strongly recommend choosing an Aquaclear Power Filter for a black skirt tetra tank. This filter combines excellent filtration with a durable design, and it will keep your tank sparkling clear for years to come. You can also read the Aquarium Tidings Aquaclear Filter Review here. Black skirt tetras are omnivores in the wild and their diet consists of worms, insects and invertebrates. They will also occasionally eat small amounts of algae and plant matter. This diet should be replicated as closely as possible in the home aquarium, which is relatively easy since they are enthusiastic eaters to say the least. Their main diet should mainly consist of a high quality flake food fed daily, with occasional feedings of live or frozen foods and vegetables. The flake food should be fed once a day, and only as much as they can eat within a few minutes. I personally recommend Hikari Micro Wafers, which is one of the best foods one the market. The easiest live foods to provide are mosquito larve (which are illegal to cultivate in many regions), daphnia, blackworms, and brine shrimp. While live food is always best, frozen food is still a good option, and is much easier to come by during the winter months. Their favorite frozen foods include bloodworms, blackworms, daphnia and brine shrimp. Breeding black skirt tetras is moderately difficult, mostly due to the fact that they are egg scatterers that show absolutely no parental care. The upside to breeding them is that they are very prolific in the wild, and breeding is easy to trigger with them. As with all egg scattering fish, the first step to breeding them is to set up a separate breeding tank where the fry can be raised. The breeding tank should be fully cycled, with a low level of nitrates. It should also be planted with fine leaved plants, since these are the type of plants that female black skirt tetras prefer to scatter their eggs over. While the tank is being set up, the black skirt tetras should be conditioned with live or frozen food for at least a week. The females will become visibly plump during this process, and will be easy to distinguish from the smaller, darker males. After they have been conditioned for at least a week, they should be introduced to the breeding tank. The males will generally chase the females, attempting to get them to release their eggs over the plants in the tank. If breeding doesn’t occur, separate the sexes into separate tanks and try again after another week of conditioning. When males are ready to breed, they will claim a territory for themselves in the aquarium and begin to vigorously defend it. The females should once again become larger during this process, as their belly swells with eggs. Once you have successfully bred the black skirt tetras, the parents should be removed from the tank, as they will happily gobble down any eggs or fry they can find. Any fertile eggs should hatch within 24 hours, and the fry will become free swimming within 2-3 days. Shortly before they become free swimming, you should begin feeding the fry. The best foods to feed the newly hatched fry are baby brine shrimp, micro-worms, infusoria or any of the commercially available fry foods. After about two weeks, they can be moved up to finely ground fish food. Would these be ok in a 30 gallon hex tank? I wanted a couple different schools of tetras, and this was on e of them. Thanks!! Great articles BTW. It’s not ideal, but a 30 gallon hex tank should be fine. Just make sure to leave lots of open space for swimming for them, and they should be happy enough. The tank you’re describing will probably be too small to keep an adequate numbers of black skirt tetras and swordtails together. Swordtails grow quite large, and while you can probably do a species only tank in the aquarium you’re describing, you will quickly have problems with too groups. 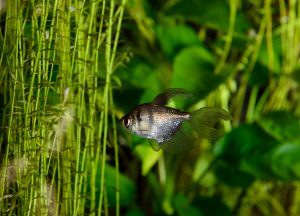 Black skirt tetras tend to get nippy and stressed if they aren’t kept in groups of at least six, and while swordtails can normally hold their own, you might have some issues with cramped quarters. So while it may be possible, I would stick with a smaller live bearer for now if that is what you’re interested in. Something like platies might be your best bet. There’s a typo for you. A little missed period, and it makes no sense whatsoever. It now reads “5.0 cm”. A “little missed period” has posed problems for LOTS of women too. LOL. Thank you for the great info! My son will have had his black skirt Tetra for 8 years this summer! It lives with a goldfish. The filter broke awhile ago. We’re afraid to add any fish or do anything differently because we are amazed at how long we’ve had these fish and want to keep them going as long as possible. Will be interesting to see how old this little fish gets! We have had one for 13 years and it has lived in a 5 gal tank most of its life. We have replaced other fish to keep him company and still he lives. He has lived longer than a cat we had and we cannot believe we had a fish live longer than a cat. I’ve heard this from a few people now, and it seems like Black Skirt Tetra’s are the Methuselah of fish. You must be doing something very right to have kept one for that long, so keep up the good work. Our black skirt lived at least ten years. It was also with goldfish, a pleco, zebra danios, and in a non heated tank. We only ever had 2, and then down to one after about 6 years. They’re pretty amazing, hardy fish. I had one that reached almost 11 years. It’s back was incredibly arched by the end, but he was still swimming along perfectly fine. Looks like I may have one of the rare tetras that lasts more than five years because my tetra is over ten years old! Very nice. You rarely hear about those black skirt tetras that keep going and going. You must be doing something right there. Have ten in a 55 gal tank w/three neons and two angelfish. Yesterday we noticed white spots on the fins of one of the skirts. Is this something we should be concerned about, or is somebody nibbling on them? When you say white spots, do you mean like little grains of salt? Or more like a spreading whiteness? Or does it look more fuzzy? Let me know what it looks like, because nearly anything it could be is serious. Also, you can send pictures to admin@aquariumtidings.com if that would be easier. My son (11) and I started a tank of GloFish Tetras – which are the same species as Black Skirt Tetras, this summer. We had 5 of them and 5 guppies in a 20 gal tall aquarium that is well decorated with several caves and plastic plants. Everything seemed great for several weeks – water cycling went well – testing clear until our Tetras got ick. We treated the tank water and they survived and the ick was gone as well we added a bit of freshwater salt. A couple of weeks later one of the guppies was missing, then a tetra went missing then one by one the guppies except 2 went missing – and at the time, none of these fish were anywhere to be seen. The guppies were acting a bit strange and the tetras were very territorial. I decided to look harder and moved a couple the caves and set them back down but still saw nothing. Then a day later our 4th guppy died and this time I found him and removed him and as I was doing so I found 2 of the “missing guppies” dead also. The next day the missing Tetra- Alive!!! ( he is now named zombie fish!) He looked a bit traumatized and not as big as his friends…but it has been 2 weeks since he returned and the tetras seem happier – not as territorial and he is eating ok. And the remaining guppy is acting normally. Now that things have seemed to stabilize, my son wants to finish getting the total fish he wanted for the tank. Because we noticed a big difference between their behavior between having 5 tetras verses 4, we are thinking to add 3 more tetras so they are less stressed. He hasn’t decided to get orignal skirt tetras or more glo-tetras but what do you think about the number of 8 total? Since these are the primary community he wants we want them to be happy and school nicely. And then he wants to add something else – maybe some ghost shimp or a cory cat or ?? ?- Do you have any other suggestions? We decided to stay away from replacing the guppies as the one is happy all by him/her self. Also, do you think we should switch to live plants and when would you do that – first, at the same time as the new fish or wait awhile til the new fish establish to change the plants. We do plan to “rearrange the furniture” of decorations when adding the new fish to re-establish their favorites spots along with their new schoolmates. That sounds like a great tank you have there. To start with, live plants are an amazing addition to any plant. They look great, and have huge benefits by keeping the water cleaning, and giving the fish something to snack on. And you’re good adding plants at any time – though make sure that you give them a bleach dip (1/20 water/bleach mix) to kill anything on the plants. As for the aquarium, you have a decision to make. While 8 fish are great, if you go for that many, you wouldn’t have room for any more. They will be far happier in a large group like that, and the schooling is usually pretty impressive. But if you stick with six tetras, then you could probably get a nice school of corydoras catfish, which are among my favorite fish. The would compliment the tetras nicely, and add some life to the bottom of the tank. The shrimp would also be great if you’d like to go in that direction, but you would probably want to get something like Java moss for them to hide and breed in. Otherwise, they may get picked off in the open and their population will slowly decline. My comment concerns the plants. It can be very easy despite what you may, or may not, have heard. I decided 3 years ago to rid my tanks of plastic plants and,long story short, found that the various Anubias species, such as A. nana, can simply be grown, well, even just sitting of the bottom of a tank, simply weighted down, the roots from the rhizome will grab the gravel and the plants will be fine. The same goes for Bolbitus heudelotii, which can do the same very easily. Both can be attached to driftwood and rocks, and normally are, but I wanted to illustrate how easy it can be, the black skirts will appreciate this! Anubias are an amazing plant to keep, and you almost have to actively try to kill them for anything to go wrong. I’ve never had much luck with the African Water Fern( Bolbitis heudelotii), probably because my water is so hard. But I’ve heard from many who have had great luck with that plant. Live plants are immensely useful in aquariums and hopefully more people try them like you. Hey guys so i have 4 black widows n my tank with 3 gold tiger barbs, 3 black phantoms and 3 bristlenoses in a 70l tank is that fine? You’re well into overstocked territory, and you really should try to aim for larger groups of each species of fish. You should try to upgrade in the near future, or perhaps return some of the fish so you can get enough of the others to get a small school. Do you mean an airstone? It should be fun running one, but you should definitely have sponge filter running as well to keep the water quality up. I have a female betta and she gets along fine with the two black skirt tetras I have. I’ll be rehoming them from a 10 gallon to a 40 gallon in a week or two, since I need to get another 3 or 4 tetras, and my new pleco will need a much bigger space. The 40 gallon has already been setup and has started cycling. Great tip about dipping the plants since I know those little snails can be a huge pain sometimes. I always love to hear about non-traditional mixes of fish working well. I know I’ve experimented like crazy in the past, and female bettas are easily among my favorite fish to keep. You honestly have me considering whether I can add one to any of my existing tanks…. I’m trying to figure out what other fish I want to add. I was considering a pair of dwarf gouramis, but have not really figured out if they’d be ok with my betta. It seems to be one of those “don’t know until you try” kind of things. I really love dwarf gouramis, but from my own experience, they tend to be a problem with bettas. I find them very nippy around a betta with flowing fins. Do you like bottom dwellers? I find catfish are great with fish like this, and they always keep away from each other. I noticed that the tetras are ok in water that is a little bit harder. I was looking at Boeseman’s Rainbowfish but I feel my 40 gallon would be overstocked if I had 6 tetras, and 6-8 of the rainbowfish. along with my betta and pleco. That was a nice synopsis! That fish is one of the hardiest I’ve ever owned, surviving many power outages when we lived in Fairbanks, Ak, coming home to very cold water and lethargic but perfectly fine fish. I have mine in a 20 high and hope to upgrade within weeks to a 30L, the most space we have. I highly recommend this fish to a beginner with a larger tank and driftwood with plants. In fact, along with the white cloud, it is a fish I can never be without! It’s nice to see there are other black skirt tetra enthusiasts out there. These rank among my top fish, and they keep going for years and years. I wish more stores would recommend these, rather than the exotic ones that die after a few days when a beginner inevitably makes a mistake. Thank you. This fish is a hardy, knock on wood I’ve also never had a diseased black skirt. Now then, I am talking about the standard fish, not long finned and dyed or genetically modified varieties. It is just a worthy a nd fun fish to own! I need advice, I am new to fish keeping. I bought a 10 gal tank and I have six black skirts in it. Well here’s the thing, I just bought it two days ago, I put the black skirts in yesterday fed them and went to work. When I came home last night the water was cloudy and has a little smell to it. What should I do and what did I do wrong? Please help, I don’t want them to die. Unfortunately, you didn’t cycle the tank. The fish are producing waste that is breaking down into toxic chemicals. If you don’t do anything, it will probably permanently injure your fish or kill them. The first thing you need to do is a large water change. And do a large water change every day until things begin to stabilize. The next thing you need to do is add lots of fast growing plants. These will uptake a large amount of the ammonia and nitrites that are being produced. Hornwort is the best, but Anacharis, or any of the other commonly available live plants will still work. You can also buy a product to treat the ammonia, but it doesn’t allow the tank to stabilize, so I tend to avoid it. You should also buy a testing kit, or bring you water in to the pet store where they usually test it for free. You need to keep track of how high the ammonia an nitrites are, so you can slow down on the water changes. You could also recommend Dr Tim’s One and Only. 4-6 caps of that stuff will help kick a cycle into gear fast in a 10 gallon. Heck I’ve cycled a 38 tall and a 125 long in a day or two with it. This is a must have in the fridge product for any responsible fish-keeper! Why is it that everywhere else on the internet and even in-store everyone says this fish is easy to care for, but when it comes to this site, they say it’s hard to care for? They’re easy enough if you just want to buy a few of them and toss them into a fish tank. But they take a fair bit of work and a relatively large tank if you want these fish to truly thrive. Like neons, they can be a delicate, but if you put in the work, they’re a beautiful fish that can like for many years. I agree, these fish are a shoaling species and do best with a tank as large as you can provide and with as many fish as your filtration allows. They actually, if given room and care, an easy fish, long lived, very adaptable, they can handle extremes in temperature especially, and mine do well in a tank with a PH of 8.0. They need room and a shoal of, say, at least 5 fish, to prevent aggression and health living. It sounds like he might have a bit of a swim bladder issue. Have you tried feeding him lightly boiled and shelled peas? That can often help. My last black skirt tetra I got in 2008 is dying right now, which is what brought me to this thread. He was the smallest of 5 and he never really grew. But he almost made it to his 10th birthday. He was a good fish. I named him Juan Pablo. He will be remembered. That’s amazing your blackskirt tetra lasted that long. The one thing I love about running this website, is hearing these great fish stories. That is such an underrated fish! Long lived at times, as this remarkable individual shows, rarely diseased in my experience, willing to live in tanks of a great variety, and very individual personalities as well. It may vie with the cockroach as the last living large creature on earth! Are these fish compatible with neon tetras? I did not see that anyone answered your question. My answer is yes, if both have plenty of swimming room and a large number of both, as befits any shoaling species. Black skirts are often given a bad rap as aggressive, when in fact if there are enough of them in a proper sized tank they are not, at all. I keep 10 in my 30 gallon long tank with 20 white cloud mountain minnows in a tank with driftwood and plants such as anubias, bolbitus, buce, and hornwort, and everyone gets along well. So I say yes conditionally, you need plenty of space, anc a good number of both species. I have a 39 gallon tank that I cycled for 3 weeks prior to my fish purchase and bought 2 different types of algae eater, and 8 black skirt tetra. I have since discovered that every 3 days I have to do a 90-95% water change because of the water becoming green. I have tried increasing the filter size by upgrading to a Whisper EX (designed to filter up to 70 gallons) but by day 3, the green is back. I tried adding algae eliminating tablets, that didn’t work as the instruction said not to be used in tanks with (algae eaters). I then added 4 marimo moss balls but the problem continues, by day 3 the green is back. Is 8 black skirt tetra too many fish for a 39 gallon tank because I just can’t seem to understand why there is such an uncontrollable growth of algae? I noticed the high nitrates when its green but it’s only happening on the 3rd day after water change. I’m using proper water purifiers like stress coat to treat the water and everything appears great. Any suggestions? I’ve had many tanks before and even bred mollies at one point but I’ve never experienced anything like this. 1) Reduce how long the light is on and make sure it doesn’t receive any natural light. 2) Reduce how much you’re feeding your fish. 3) Add more live plants to the aquariums. Also, some water has high levels of phosphate, which can also be problem. But even if you control everything, sometimes a new tank will still have algae problems. Usually it will sort itself out if it’s just a new tank problem. That is baffling to me. I agree with Robert in all things but I have 3 tanks that receive direct light for 6 months of the year with no real problems, especially such as what you have mentioned. Still, something is terribly amiss. Your bioload seems fine, though we don’t know the size or type of algae eater. 8 black skirts is a tiny shoal in a tank that size. I will tell you what I have and perhaps it may help, perhaps not. My BS are with the white cloud mountain minnow in an inside unheated tank of 30 gallons long. I have 10 and will soon have 20 white clouds when some are out of the quarantine tank. I utilize 2 large sponge filters and a small HOB with nothing but poly fiber in there as medium, as well as a prefilter. My substrate is large inert sand. I have several pieces of driftwood and the tank is full of aquatic epiphytes, bolbitus, anubias, bucephalandra, and a large mass of hornwort. My light is a simple 1 watt Beamsworks on 8 hours a day. I feed the fish sparingly 1X daily. I have hair algae that is easily controlled. You have bred mollies so know tanks, if this seems patronizing I apologize. I can’t help but wonder if the cycle was not quite complete and problems derive from that? I would add easy rhizome plants if you have none, and the easy to keep hornwort or another floating type plant to act as a nitrate user. Wood of course is desirable for plecos and actually every fish nearly. I also add of a couple of leaves to decay in the tank, as they decay it seems to help with fish health. A lighting schedule of 4 hours on and 4 off I have done successfully as well to aid in algae removal. Time might be your best helper as you work on the problem and observe the condition everyday. I really wish you luck! What does the article mean by “finely ground fry food”? Would Hikari First Bites be okay? Or crushed tropical flakes (like what the parents eat)? Some of the fry food is bit to large for fry and sometimes it needs to be ground further to make it small enough for the fry. But Hikari First Bites are a great choice for newborn fish, though you may want to provide something smaller like infusoria or microworms for the first few days. I have one that will be about 14 years old. Got from my boss about 4 years ago. Now that’s an impressively old black skirt tetra. You must be doing something right to have one live that long. This can go on forever, but that fish deserves it. That is incredible! It says a lot about its resiliency, adaptability, pure doggedness, especially when well cared for. SInce this post was created all my black skirts are still with me, though not 14 years of age! I have two black skirts, one male and one female. The female has become extremely bloated and sits in a corner of the tank most of the day. Is this normal and should I be worried? It definitely sounds like she’s ill. First, test your water, as bloat is often caused by poor water conditions. If the water is fine, then I’d try feeding lightly blanched and shelled peas to the fish. Peas can often clear up swim bladder issues and constipation. If the peas don’t help, then I would remove the fish, as bloat can be contagious and often fatal. Once the fish is removed from the tank, I would feed her antibiotics, though to be honest, few fish ever recover from bloat. By the time they become bloated, they usually have organ damage. Good luck with your fish. What Fish Can You Keep in a Fishbowl? Disclosure: Aquarium Tidings receives compensation from the companies whose links we post. Aquarium Tidings is independently owned and the opinions expressed here are our own.